As a licensed REALTOR®, I work to protect your best interest by providing complete and professional guidance to you. I work hard to find the right home for you, in the right location and at the right price! I want my customer's to be customer's for life! I realize that the success of my business depends on my client's satisfaction. I rely on my customer's referrals and repeat business so I work to ensure that you are completely satisfied with my efforts in assisting you to buy or sell a home! Check out my newest video testimonial! Thanks Ben & Nikki! Check out my newest testimonial!! Leanne won my trust when she listened to my needs and concerns addressing each one as much as was needed so these seemingly obstacles took a back seat to my goals of selling. I felt respected and heard by how Leanne partnered with me to sell my condo. I especially appreciated her balance of professionalism and being personable. Her flexibility combined with knowledge in real estate was evident when we negotiated and accepted an offer even while I was overseas. I would recommend Leanne if you're loking for someone to help you with your real estate concerns.. I first found Leanne by conducting a simple internet search of realtors back in 2011. I picked her smiling face out of the masses and it was the best "click-cision" I ever made. Leanne helped me and my then fiancée find an apartment within our means and our plan was to upgrade to a house once our family expanded. We tried a few times but with the market being so hot it was really difficult to get into the housing market. We were amazed by how much our apartment went up in value and so glad we listened to Leanne and were patient and sold at the right time. Leanne helped us on so many occasions and showed us countless listings. She always made us feel like we were her number one priority even though I knew she had so many clients and was always busy. We finally purchased our first home in November 2016 in a quaint little pocket that Leanne had introduced to us a few years back. Over the past 6 years my husband and I have forged a deep connection with Leanne. Both my dog and daughter love Leanne as she is so kind, sweet and genuinely a good person. Leanne is very understanding, always there for you and also extremely smart, sharp and a firm negotiator. If it wasn’t for Leanne we would not be where we are today; a happy family of 3 with another on the way and a dog in the perfect home in a cul-de-sac in an amazing neighborhood! I’ve recommended Leanne to all my family, friends, neighbours etc. as she truly makes decisions in your best interest and never pressures you into making a decision. She is about relationships not the sale. I would recommend Leanne to family & friends. Because this was an estate, there were 6 families to please. You stepped up in every way. Sometimes you helped me as an executrix with things I didn't understand or think of, for the best outcome for all of us. You were highly professional. In the meeting with our estate lawyer I could see he was very impressed with how you handled things and so was I! Your guidance and advice through this process was invaluable. Anyone would be lucky to have you as their agent! As this was our first time selling a home, Leanne made us feel very comfortable throughout the whole process and was always so kind, patient, and very knowledgable. She was a dream to work with from start to finish and even got us more than we had anticipated for our home! We will definitely be recomending her services to anyone we know selling a home in British Columbia! Thanks again for everything Leanne - you've been amazing! Leanne was able to find what we needed, effeciently and accurately! She gave us guidance and great advice in the unfamilar condo world we embarked on. She saved $1,000's by making a shift call on our offer. Overall one great experience! I enjoyed the experience of working with your and was impressed with your professionalism and knowledge of the business. You are very professional and at the same time very open & helpful with an ease of relaxation that didn't make me feel pressured to sign documents I wasn't sure about! Best of luck to you in the future & hope all goes well for you and your family! Leanne was friendly, knowledgeable and offered great advice! She initiated contact with us often and was always available when we needed her. She was friendly, patient and very professional while we were selling our condo. Best of all she really understood us and our needs. We hope to work with her again! Leanne was very knowledgeable, helpful and offered valued advice! Leanne was courteous, caring and professional. She worked very hard to find us the perfect family home and I appreciated her honest opinion and advice along the way! She made sure she was knowledgable of the areas within which we were looking and provided us with a lot of information about those areas. Thank you Leanne! Leanne was very professional in every aspect in selling and finding me a new home. I will gladly recommend her to family and friends! About 6 months ago, Ben and I were contemplating the idea of listing our townhouse.... Luckily I had just joined this great group of people and met Leanne Drolet! We invited Leanne over to chat about the service she offered and we were both so impressed with her ideas that we chose to list our property with her. Leanne gave us great advice on how to get our home ready for sale, she even included a consult with a professional home stager. We were extremely happy with Leanne! She sold our home quickly and very close to asking price! Next was hunting for a new home! This was quite an experience..... The market for detached houses in the area was extremely competitive. Leanne had advised us that the market was hot and that we needed to be strategic with our offers. We entered many bidding wars and Leanne always put in the extra effrt for us, presenting our offer in person, hanging out with me for many hours for our pre offer home inspection, and even going further and writing a letter to the seller on our behalf. When we lost a bidding war, the very next morning Leanne would have a list of other possiblitites for us. After 2 failed home inspections, and losing a bidding war, we bought our home! During the whole process, I always felt that Leanne had our best interest at heart.... Truly caring about our needs and wanting the best for us. We appreciate all your hard work and support!!! I was very satisified with your service. You communicated and managed expectations honestly, and deliveredd the outcome I wanted: an expedient sale so that I could go on with the rest of my life. I'll certainly keep you in mind if anyone I know needs a realtor in the future! Leanne was the best real estate agent bar none. With my husband and I combined, we had bought and sold three other homes before, using real estate agents other than Leanne. For the sale of this more recent home, forunately for us, Leanne came to us strongly recommended by friends. Leanne's service was far above what we had dealt with in the past. She was there for us during the whole journey. We never felt pushed from the time that we had our initial conversations regarding whether this was the time for us to sell our home - was the market ready? Were we ready? She continued to be there for us long after the closing date and took the time and effort to remind us of the leftover pieces that were still dangling even if it was really no longer her responsibility. We were 120% satisfied with the service we received! Leanne was available for us at any time of the day or night and as often as we needed. She was always patient, never condescending, and answered all of our questions with an informed and thoughtful answer. She is above all, one of the most honest people - ethically grounded in everything that she does - wanting the transaction to be fair not only to us but to the buyer as well ( a rare quality). Leanne is a perfectionist and very detail oriented regarding the required documentation and didn't miss a single piece of the deal. She was always on time to our open houses, and gave over special touches to help us out. She is a strong resource person for contacts for movers, mortgage brokers, housing inspectors etc. Buyers reacted well to Leanne; she has an easy going style and is genuinely friendly and curious about other people. Her pricing of our house was very solid and we ultimately had multiple offers, and sold our house above asking in a very short time. Selling a home requires not only a real estate agent who is practically and intellectually focused on the numbers/business side, but also requires someone who can ride the waves of the emotional roller coaster with you. There is not one suggestion that I could give in terms of Leanne's improvement. We would highly recommend Leanne, without hesitancy whatsoever, and with a loud "hurrah"! I was very, very satisfied with my service from Leanne Drolet. I felt communication was frequent and very thoroughly to make sure that I was happy and protected on everything. All my concerns were addressed and Leanne handled the sale and purchase of my home very professionally. Leanne, keep doing what you are doing - you are most professional and caring realtor I have ever met! I would highly recommend Leanne Drolet as a realtor to anyone. I have sold three homes in my lifetime and without questions, Leanne stands above all. Her professinalism, sensitivity, dedication and regard for detail are outstanding. Selling a home can be very stressful and Leanne takes the stress out of selling and reassures you every step of the way. I honestly felt that Leanne had my best interests at heart at all times. Not once, did I feel that she was just trying to make a sale. She would walk through every detail every step of the way to ensure the best end result for me. She explained every aspect of the sale in great detail along the way and always allowed me to have the final say in any direction we took. Leanne hired a stager to come into my home to make it look the best it could in order to sell quickly. She also hired a professional photographer who took pictures that highlighted my home that got "buyers in the door". My home had over 40 showings in a month and Leanne was present at 98% of these showings. Leanne would keep me informed about all of the comments of potential buyers and realtors so I was abreast of all of the information. Together with her advise, we were able to work as an informed team to get the top dollar for my home. As a first time buyer I feel very fortunate to have landed in such capable hands! Leanne was recommended to me by a professional in another field and I am so grateful for the recommendation. Leanne provided me with the best of care as we looked for my new home. Working with Leanne was like having a friend helping me find a home. She is a hardworking enthusiastic professional who clearly enjoys her work. She was always friendly, helpful, available, and always very patient and understanding. I felt right from the start that she was taking a personal interest in finding me the home that would be a really good fit. 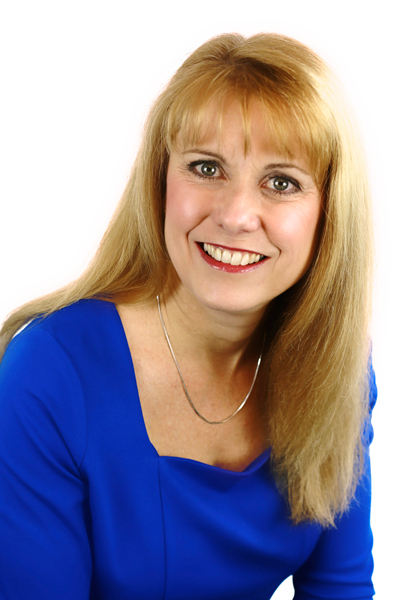 Leanne genuinely listens to the needs of her clients and is committed to finding the "right" home for them. I believe she knows her business well. She has a thorough knowledge of the area she serves and can easily inform her client on amenities, transportation, traffic patterns, schools, recreation, as well as market trends, "value" of neighbourhood, pricing, future resale considerations, municipal regulations, etc. She showed me a good range of homes within my search criteria and budget, and with any property that I found interesting, she discussed with me the negatives as well as the positives of the area, neighbourhood and property as they pertained to my specific needs and wants. When showing prospective homes, she often offered suggestions for improvements and for increasing the home's value. She asked questions and checked details that I didn't know of or think of. If she or I had any questions about a property that she couldn't immediately answer, she had an answer by the next day at the latest. She has a good network of professionals whom she can contact for very specific information. We found a great house for me and with her guidance the purchase process went smoothly. Leanne followed up in the following weeks to ensure that everything was satisfactory. Leanne combines the knowledge and expertise of a dedicated professional with a caring and friendly manner. I will definitely use her services in the future and highly recommend Leanne to anyone looking for an outstanding realtor! We were very satisfied with the service we received from Leanne. She was always available to answer all of our questions and concerns and did so promptly. We felt that she always kept us in the 'loop'. As stressful and daunting selling and buying a home can be, Leanne always made sure we had all the info we needed. Several times throughout our experience my wife and I had concerns and questions that were answered quickly with a text, phone call or meeting. Leanne provided valuable information that we would not have known without her help. We could not have asked for both our transactions to be handled any more professionally. Every detail of both our sale and purchase were properly and thoroughly explained. This insured that no unexpected costs or issues came up. The fact that we had challenging dates made this even more impressive. Our experience with Leanne as a whole was all positive. We have, and would recommend her services to our friends and family! We love our new home!!! We are truly happy with our first new home, and we owe you immensely for all your effort and tireless dedication all throughout the house search and purchase process. We were very pleased with the level of professionalism, prompt service, and pragmatic approach. Since the first time we came to your office, we admired your patience to explain the steps to purchase a house, your tireless and vigorous attitude when looking for that right house, and the long hours when filling out the amount of paper work required. We felt that you were truly working for us. You made us feel we were in good hands. If we are in the market again, either to buy or purchase a house, no doubt, we will be very pleased to have you helping us again. I have moved to and from many provinces for work and I have experienced many agents in my efforts to buy and sell, so I speak with an abundance of experience. 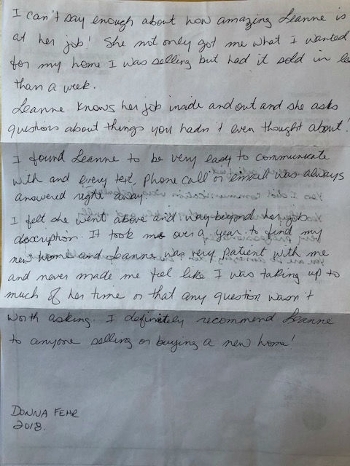 Leanne offered professional and pleasant service, dealing with me being in out of province and having to deal with a number of family issues that placed extra demands on her. On top of this, a difficult market and a sense of urgency put more demands on her as well. Over all these challenges, Leanne was patient, creative, determiined and knowledgable. I truly appreciated her being there for me and delivering on every promise or commitment she made. I have no reservations in recommending her to anyone looking to buy or sell and promise that you would be hard pressed to find a better agent anywhere. Leanne used her market knowledge and thorough research to price our home much higher than other Realtors proposed and she attained this price for us. Given the fact we are living in Belgium with a 9 hour time difference the communication should have been challenged but it was not. Leanne was accessible for discussions outside of normal office hours and always gave very clear and timely feedback. We have bought and sold 3 houses in the Vancouver area and always used a different Realtor as we had never found one that we felt met all our needs. Leanne did that and we will definitely use her again if we buy or sell in the area. Leanne Drolet was with my fiancé and I from start to finish of the daunting process of purchasing our first home. I found Leanne from an internet search and subscribed to her automated home listing service. At first I had no idea what I was looking for; it was just nice to look at the listings. During this time Leanne and I made contact a few times through email. She helped me refine my search by asking me thought provoking questions and giving me advice and tips on buying real estate. A few months later when we were actually ready to start looking Leanne brought us multiple properties. She was able to book viewings within 24 hours notice. She worked around the clock and we were really impressed. We were interested in one property and within hours Leanne advised us that it was a leased property and the lease would be running out next year. Leanne saved us much time and stress. When Claudio and I finally found the apartment we wanted Leanne was ready to roll. We first looked at the apartment on Friday of the long weekend and we were signing papers and putting in offers that night. Leanne worked over the long weekend, she emailed me the final offer at 3:00 am. She cut her family vacation short, she even worked from the hospital when her son went in for emergency surgery. Claudio and I were amazed by how hard this woman works. She read through all the Strata Minutes and building envelope information and made notes of potential points of concern. Leanne makes her clients her first priority and we felt very special and looked out for. She held our hands the whole way. The support she provided us was much needed. Leanne helped us negotiate a great price. We couldn’t be happier in our new home. It all happened so quickly and I still feel like it’s a dream. We own our own place! No more renting. We even have an affordable mortgage, an amazing feat especially in this pricey market. The benefits of having Leanne as a buyers’ agent are endless. When we are ready to purchase our next home we will definitely be enlisting Leanne’s services. We have already referred her to friends and families as they were amazed by how quickly we got into our new place and were surprised by the deal we got. We were extremely satisfied with the service we received. As first time buyers we needed a Realtor that would be extremely patient with us. We felt that we could express any of our concerns to Leanne, without any fear or embarrassment. Thank you so much for all of the time and effort you put in for us. You truly care about getting people into the right home for them, and that was so important to us. You were patient, thoughtful, trustworthy, and knowledgeable. Trevor and I will be recommending you to all of our friends and family in the future. We couldn't have done it without you! Leanne - we cannot express to you how thankful we are that we were able to work with you to purchase the house that has become our home. Your patience and professionalism deserve the highest praise. Your manner raises the standard of service excellence. We love our new home and have enjoyed our experience - thanks to you! Should we ever decide to move - we will definately seek your assistance. Thank you so much for finding the perfect home for my son and I. After meeting with several realtors you were the only one that understood my financial situation and kept to the price range that I could afford. Being a single mom the cost of purchasing a home and being close to a school were our top priorities. You exceeded our expectation and found us a beautiful 3 bedroom home with full updates! Your honesty, thoughtfulness and determination is so greatly appreciated. Thank you so much Leanne. You have a friend and client for life. Very professional.....I would recommend her to anyone! Leanne Drolet was referred to me by a very close friend. I had been trying to sell a house for many months without success. Leanne was not satisfied to merely advertize the property on the MLS and create a feature sheet. She very actively marketed the house, with open house showings almost every weekend. She worked the list of potential buyers, keeping them in the loop as the market changed. Leanne consistently conducted herself in a very professional manner. She took the time to explain the multitude of forms that accompany the home buying and selling process. I grew accustomed to regular updates from her, and I can say with 100% conviction that she acted in my best interests at all times. I have bought and sold with Leanne, and I will be listing another property with her in the very near future. I would recommend her to anyone! Thank you for being such a a calm yet informative support for us when we purchased our first home together. You handled the other realtor with such finesse, and at no time did we wonder about the information that you gave us. Your integrity and honesty were refreshing as well as your knowledge of the laws and other feedback we received regarding our purchase. We appreciated your efforts to help us find our dream home that was within our budget. Thanks again! Leanne was very patient and took the time to explain the whole process and to help us evaluate houses. She was very professional and as new buyers we needed a lot of help, and Leanne was quite considerate as we took our time to shop. Leanne Drolet was our Realtor for over a year helping us locate the perfect house to fit our many needs. From our first meeting with her through to the final inspection she has been consistently patient, compassionate, knowledgeable, professional, accommodating, helpful and proactive. As first time buyers we asked her every question imaginable, sometimes more than once, and she was always insightful and wise and in the rare case that she didn't have the answer, she would not hesitate to get it. We wanted to look at every kind of habitation from mobile home to townhouse to duplex in every city from Whiterock to Anmore to Mission and she was always ready and willing, working around our crazy schedules for showings. On more than one occasion she actually saved us from a bad purchase with her experience and intuition, pointing out potential hazards and researching properties for flaws. Her opinion is gold! Leanne always worked above and beyond the call of duty, and I can not imagine a better home buying experience than the exceptional service we received with Leanne. You absolutely will not find anyone more dedicated and committed to your needs than Leanne Drolet. I am looking forward to eventually experiencing selling our home with Leanne and excited about the next time she helps us find our dream home! Thanks Leanne, for everything you do, stay in touch! Leanne, I couldn’t have asked for a better agent. You were wonderful and patient and a great listener. You provided not only great feedback and insight, I felt you truly were interested in what I wanted, as well I felt you had my best interests in mind at every occasion. You were not just interested in closing a sale but what I truly wanted and needed. You are a true professional! Leanne is extremely professional with an air about her that makes you feel comfortable and in capable hands. Leanne worked hard to sell our manufactured home. She kept us well informed, held multiple open houses and got our home SOLD! I would highly recommend Leanne. I was very satisfied with the service I received from Leanne and felt that all my concerns were addressed in a frequent and timely manner and that the information was provided in a manner that was easily understood. My transaction was handeled very professionally. We were 100% satisified with the service from Leanne Drolet. Our concerns and transaction were handled professionally. If we are ever in the position to recommend a realtor, it would be Leanne Drolet all the way. Thank you seems to be so small to say about the service and experience you provided for us.